Last month, Gul Begum and her elder sister Dur Jamal, aged 11 and 13 years, were standing outside their tent in Dalbandin when their lives changed for ever. According to Dur Jamal, a donkey had come too close to the orphans’ tent and they were trying to push it away. Suddenly, two masked men appeared on a motorcycle, dousing them with acid and inflicting severe burns on their faces. In just an instant, like so many other Baloch girls, they had been turned into innocent victims in a sordid war that made their scars a symbol of the power of certain groups. A couple of days later, an organisation calling itself the Baloch Ghairatmand Group distributed pamphlets in the Dalbandin area, including the Press Club, private houses and shops. The pamphlets warned that women leaving their homes would be disciplined like the girls in Dalbandin. Warnings and even, allegedly, a target list of women who had been seen venturing out, were circulated via cellphone. The driver of a van from the Government Girls College reported that he had been stopped and told that girls walking to the college would be attacked. Local people claimed that the culprits were unknown to them and that they had never heard of the group before. The violence did not stop with the orphaned and destitute sisters who had lived all their lives in a ragged tent in a poor Baloch village. A fortnight later Nazima Talib, a professor of mass communications, was gunned down as she stepped into a rickshaw outside Balochistan University in Quetta. Unlike the acid attack, which had taken place in the evening in a relatively remote area, the attack on Prof Talib occurred in broad daylight on a busy street, demonstrating the audacity of her killers. A professor of two decades’ standing, she was widely respected and well-known in the university’s academic community. Her gunmen sprayed her with so many bullets that she died instantly. Few definitive reports are available as to why Professor Talib was targeted. 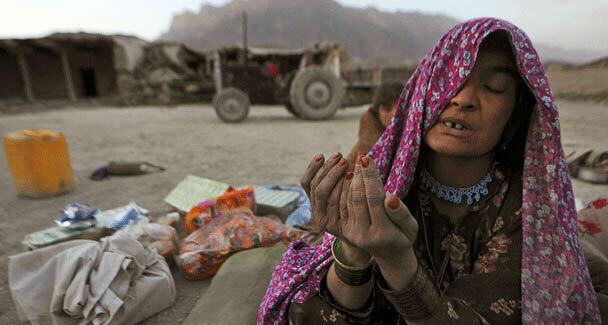 While Balochistan was still reeling from Professor Talib’s brutal killing, women in Balochistan were targeted again. This time the victims were three young girls who were returning from a wedding in Kalat. Twenty-year-old Fatima, 14-year-old Sakeena and eight-year-old Saima were passing near the village of Babo Mohalla when two masked men flung acid on them, inflicting severe burns on their faces and other parts of their bodies. Yet another group claimed responsibility, distributing pamphlets the day after, warning women against leaving their homes without a male relation and instructing them to wear the hijab. President Zardari took note of the attack a few days later, calling them ‘barbaric’. A few local suspects were rounded up but little information is available as to the larger connections of the group. Since the attacks, Balochistan has remained tense and many women choose not to venture out for fear of being victimised. According to reports in various newspapers, during the past week two government girls’ schools have been closed indefinitely due to threats from the Tehrik-i-Taliban Balochistan and the Balochistan Liberation Army. The attacks on women in Balochistan and the lack of outcry or attention at the national level represent the afflictions facing the country. Beset with ethnic separatists that hold grievances against the usurpation of local resources and an itinerant and increasingly volatile branch of the Taliban, ample room exists for the proliferation of conspiracy theories that lull the public into inaction. With each new attack, a new set of rationalisations is created: the girls in Dalbandin were poor and hence probably just vagrants; Nazima Talib was Punjabi so her death must have been caused by the BLA; the girls in Kalat had loose morals so they deserved to be attacked and killed. Each new act of violence seems to bring with it a new explanation that alters the moral shade of the attack from ugly black to murky grey, pointing towards the possible complicity of the victim in the act itself. The public, otherwise willing to take to the streets over any issue, mollifies itself with the comfort that no anger or repulsion needs to be reserved for the attackers, and no empathy for the victims because it must have been, at least in part, their own fault. It is this moral miasma that prevents Pakistanis from acknowledging the horror of the killing, maiming and targeting of women in the streets of the country. The women of Balochistan, caught as they are between a tribal power structure that gives them little autonomy, the ever-encroaching Taliban and the military’s presence, have little to hope for. Change is unlikely in a country mired in problems and more concerned with Facebook pages than the complete absence of physical security for millions of its women. This sort of violence against women, where their bodies have become political sites where various groups contest their control over the territory, is likely to claim scores more as long as the public refuses to decry it. In the meantime, any woman venturing into the streets of Pakistan must do so with the knowledge that anyone who chooses to shoot them, assault them or fling acid in their faces is unlikely to face any sort of punishment. It is true that violence against women exists in every nation of the world, but perhaps only in Pakistan is it so easily tolerated and so rarely punished. The writer is a US-based attorney teaching constitutional history and political philosophy. Why you must not rush for salaat! Arrogance a quality of Satan. Israeli professional liar put in his place!